There are so many choices! Difficult to choose....which one is your recommendation??? Normally, I use Virgin Mobile, but use T-mobile if I'm out and thinking of browing the internet. 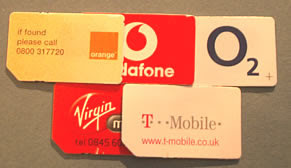 At the moment, I've topped up my O2 so will have to use 300 texts this month - February is unfair, it only has 28 days!